Julia Child, in this one statement has almost covered my entire post. Whenever I write a post I try and describe the essence of the cuisine and the dish that I am covering. But then, what I want to cover today is something special, a first of sorts even for me. And so, I’m thinking, how do I describe a cuisine that that ranked number 4 when people were asked to name an ethnic cuisine. And in list of the “World’s 50 most delicious foods” compiled by CNN, 5 dishes from here made it to the list including the number 1 dish. Sounds impressive, doesn’t it? Any guesses which cuisine is it? I so want to be partial and say its Indian cuisine, but this time we’ll have to give it to Thai Cuisine. Just like what Julia Child said, Thai cuisine is simply a little of everything. What may seem a simple dish to casual on looker, is actually a complex coming together of many flavors. Thai food is known to have a balance of at least 4-5 flavours in each dish. Pineapple and prawns is a combination that absolutely made in heaven. This is again a one pot meal that you could put together in like 20 minutes flat. I made this as a first attempt on Thai food and it came out pretty well. Many more to come, I promise. Do give it a try, I’d love to hear how it turned out. 4-5 French beans, cut into bite sized bits. Using a mortar and pestle, roughly pound the chillies and garlic to a rough paste. In a large pan or wok, heat oil and fry the basil leaves till they are crisp. Remove and keep aside. To the same oil, add the chilli garlic paste and fry till the garlic is brown (but not burnt). Add the pineapple and stir fry till the pineapple have a slight brown coating. Add the prawns and cook for about minute till the prawns are cooked. Add the french beans and cook. Combine the Pineapple juice, Fish Sauce and Soya Sauce in a bowl and stir well to combine. 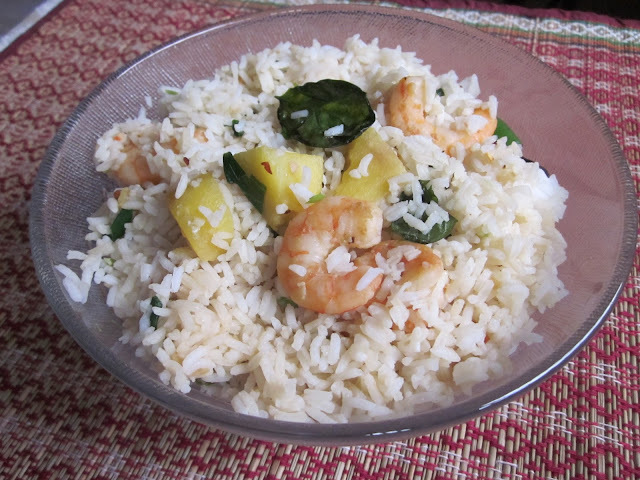 Add rice to the wok and and some of the mixture of the sauces and pineapple juice. Mix well to combine. Repeat this process for the remainder of the rice and the juice mixture. Now add the fried basil leaves and give it a final mix.